So how do I make all this art? Well…it takes time. And some paintings I’d never do the same way again, and a few I’ve completely forgotten how I did, and one or two I’m not sure that I could recreate, even if you paid me. 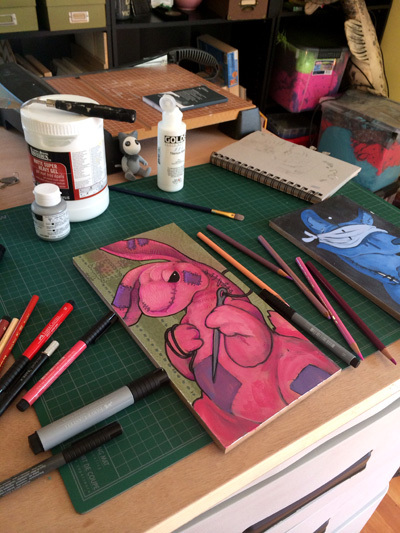 But the basic method for my mixed media pieces is pretty simple. I do a sketch. Very rarely, this is a physical sketch (I like a brown paper notebook for that) but usually it is done digitally using Photoshop, a program called Painter, and an Intuos tablet. When I’ve got the sketch laid out, I will do a kind of underpainting digitally. This involves some basic color, some shading, some linework. I do a lot of moving things around, re-drawing, muttering, erasing, more muttering. Then I print it on my Epson printer, which has waterproof ink. Once printed, I seal it to a piece of board with super heavy matte medium, and then put a very light coat of clear gesso over it to provide tooth. Then I work it over with colored pencils, acrylic paint, and PITT pens, until I’m happy with it. And…that’s basically the process. The end result is a one-of-a-kind original with texture and heft, sealed on archival board. I experiment a great deal, I try all kinds of new styles, I get bored easily and move on to other things, but this is the method that I keep coming back to. Hope that helps!